Sardanapalo, has been released under the audite label, and is now available worldwide. Franz Liszt never finished his mature opera Sardanapalo. Now 170 years old, the first act refracts the world of mid 19th-century opera through the prism of Liszt’s unmistakable voice. Kirill Karabits conducts the Weimar Staatskapelle: Liszt’s orchestra in the city in which he composed the opera. 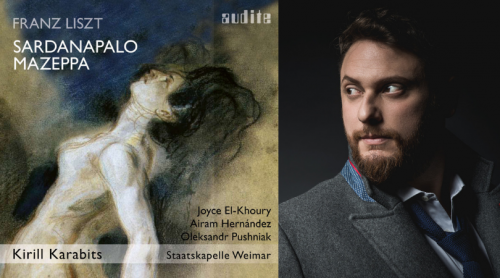 The superb cast of singers of this premiere recording consists of Airam Hernández, Joyce El-Khoury and Oleksandr Pushniak. The Sardanapalo manuscript comprises the first act. For 170 years the material lay dormant in the Goethe and Schiller archive in Weimar: it was only in 2017 that David Trippett deciphered, edited and orchestrated the manuscript at the University of Cambridge. Recording: August 17 – 20, 2018 in Weimar, Germany.